Timberline is turning 75 this year and are celebrating with a tribute to Woody Guthrie (who would be turning 100)! Most people that have heard of Timberline know it was used as the setting in that classic Kubrick film “The Shining” starring Jack Nicholson. It’s located right on Mount Hood and it really is an amazing site to see, especially in the Summer months. 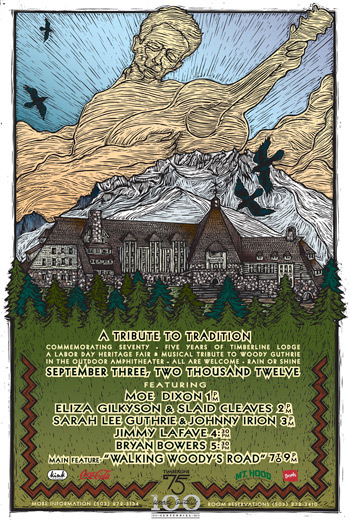 Anyway, for Labor Day, Timberline is celebrating it’s heritage and looking back at it’s history from it’s founding in the Great Depression Era and it’s journey through time, blending the old lodge feel with natural preservation, mountain recreation, and innovation. The humble people at Timberline have decided to not make it all about themselves, but instead is putting on a show, a sort of miniature festival, as a tribute to Woody Guthrie. Singer songwriters, all with connections to Woody, will be performing in the Outdoor Amphitheater and ends with a performance of “Walking Woody’s Road”, telling stories from the life of Woody Guthrie through songs, writings, and lyrics from the Guthrie archive. If that didn’t convince you to check it out, maybe this brilliant poster artwork will. It is very well done and really shows the feel of the Northwest as well as the spirit of the singer songwriter genre. Oh and of course, there’s always more info on their website.